When I travelled to the West Coast this summer, my intention was to have a few weeks respite from HNW client engagement. But, standing in the men’s locker rooms at AT&T Park, I started to think about what the wealth industry could learn from the San Francisco Giants; specifically, their understanding that effectively managing customer data and using it to improve visitor experience can be a buffer in times of poor performance. For the Giants, creating a memorable client experience is not just about interacting effectively with current fans but delivering an engaging experience to visitors and opposition players too. They believed that such a strategy would enable them to cement a life-long loyalty to the team. In the context of wealth, it would equate to wealth managers thinking through the experience of prospects, product suppliers and competitors alongside their clients, ensuring that all those interacting with the brand had a consistent and positive perception. 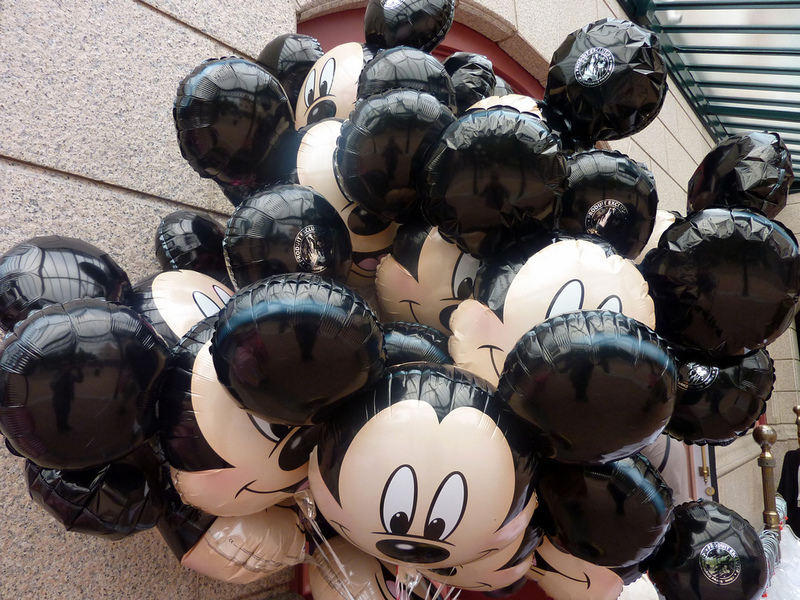 To excel in customer engagement, the Giants’ staff were sent to Disneyland – widely regarded as the King of client experience. The assumption was that employees needed to witness first-hand what a great customer experience looked and felt like. In our experience, when consultants place other industries (typically auto, hospitality, etc.) on the pedestal of exemplary client experience, the typical push back from those in wealth management is that they are not directly comparable. After all, a wealth management experience is the sum of a number of different types of transactions and conversations, not just a single purchase or a single product. But here comes the the block to the plate – if we cannot send wealth managers out to experience other sectors’ client engagement practices, how can a firm, and most importantly, how can a client ensure that they have the best possible information on the best practices on offer? More than any other sport, baseball loves its statistics and as a result, everything is accounted for, explained and recorded. This is where we could build a strengthened CX approach in wealth– we need to see more measured approaches in the establishment and publications of client engagement benchmarks or indexes. It is only through such reporting that wealth managers will be able to pinpoint their flaws and ultimately improve on them. Those firms that are already surveying their clients often publish NPS (net promotor scores) and CSAT (customer satisfaction) scores. But these metrics really only scratch the surface when it comes to client engagement and give little information on what a customer might expect and need from their firm. Actually, our experience shows that a deeper dive is needed to determine how a firm delivers on its customer experience. Benchmarking the entire client journey can ascertain where the service hooks might be, and where there is room for improvement relative to competitors. 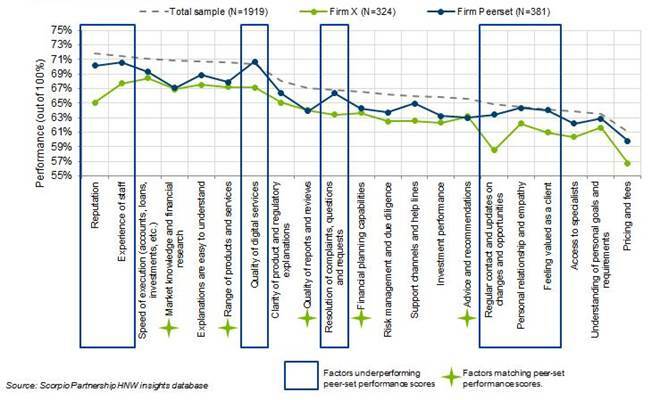 For firm X, for example, underperformance on brand reputation, digital services and resolution of complaints are the priority development areas, based on their alignment against competitors [Figure 1]. As sports fans will know, all teams will go through good times and bad, have winning periods as they bring their players to peak performance, and suffer through times where performance drops off. Much like wealth managers who are subject to the vagaries of the markets and economies, they will not always call the right moves. At times like this, it is important to never let a client experience falter, despite the results on the business scoreboard. In fact, a strong client experience can do wonders in cushioning periods of poor performance. The wealth industry as a whole is some way off establishing a peer to peer benchmark, despite Scorpio Partnership’s best efforts to date. Making this benchmark eventually available to end clients would be, in our eyes, the ultimate grand slam. We believe this would enable firms to understand their true value to customers, but ultimately empower the end-client to select those firms capable of delivering the best possible client experience. 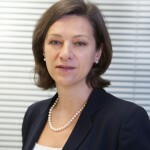 Author: Caroline Burkart, Director at Scorpio Partnership.